Print copies of The Ampersand magazine are being handed out Tuesday, Dec. 6, 11 a.m.-2 p.m. in Marletto’s, the University Center and Emerson Library. The digital app is available in the app store and Google Play and now available for iPhone. 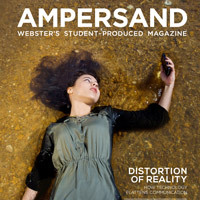 The Ampersand is an award-winning magazine produced by students in Webster University’s School of Communications. The magazine's faculty adviser is Karen Burch, videographer in Webster’s Global Marketing & Communications, who also teaches the Magazine Production course in the School of Communications.